This is a Dodge Dakota with a 7ft fabric-sided pop-up. It is too narrow to sleep across the body, so there is a longitudinal double berth that is partially in the cabover. This is a Dodge Ram long-bed with a 10ft all-hard-sided camper - the lifting top rides over/outside the fixed bottom. Including a cabover was sufficiently difficult that it's been left out. Again a Dodge Ram, with a 8ft mixed hard- and soft-sided camper that pops out as well as up - this is a copy of some camper plans offered on Ebay (item 4535791609, seller meadgl). After the hard roof and hard front/backs have been lifted, bunks fold out each side and are covered with 'canvas'. A version of the Camper 1 design to suit the Dodge Ram. The same combination of hard and soft sides, but now with a transverse double berth in the cabover. Thanks to Dodge for putting their body plans on their web site! And, yes, the 'ground' slopes in the Dodge drawings too! 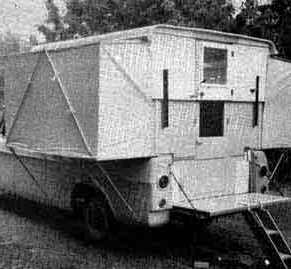 In case you thought that building your own pop-up truck camper was a new idea, here is one built from plans from Popular Science in 1967. You can download a pdf of these plans here. 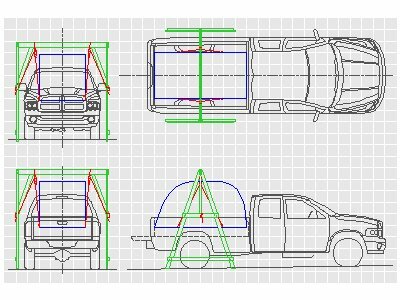 Here is an idea for a hoist and frame to lift a trailer body up and so allow it to be loaded into a truck. Most of the frame is made of 2x4s with two 2x6s lagbolted together used for the horizontal beam. A test is needed to see if 2x4s are sufficiently stiff to use for the legs - if not, 4x4s would have to be used. As this is potentially a dangerous operation, you would need competent woodworking and knot-tying skills, and to safely test the load capacity of this structure, if you intend to use these plans. This hoist is not intended for lifting the campers above which are probably too heavy unless the frame were made stronger. View a pdf file of the plans of this hoist.